Home » Texas Ranger Museum » Get Involved! The Texas Ranger Hall of Fame and Museum is the official State historical center of the legendary Texas Rangers. Founded in 1964, it was the first dedicated law enforcement historical center in the US — representing the nation’s oldest statewide law enforcement agency. A landmark on I-35 for 50 years, more than 4 million persons have visited. Television documentaries and stories have featured it throughout the US, Europe and Asia. Its educatioprint and public service programs reach a wide audience of youth and adults. We are a public/private partnership. Private and corporate sponsorships and donations are an important part of our funding. Through your support, we can advance our mission to share this Texas Legend and American HeritageTM with future generations. 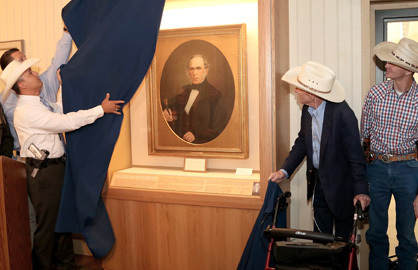 Texas Ranger Patrick Pena unveils Sam Houston Portrait in its new case to exhibit donors J. Fred Bucy III and Joshua F. Bucy in August 2017. The TRHFM is a tax-deductible, IRS Section 170(c) charity.